Long-serving defender Duff ready to add to the history of the derby! There’s nobody more experienced in the Clarets camp than Michael Duff when it comes to the East Lancashire derby. The long-serving defender has featured in seven fixtures during his 11 years at the club and has tasted both agony and ecstasy. The 37-year-old sampled the rivalry in his first season for the club in a goalless draw in an FA Cup tie at Turf Moor. 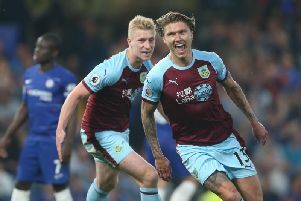 Late goals have provided the platform for heartache since over the years - namely Morten Gamst Pedersen, David Dunn and Jordan Rhodes - but Sam Vokes in a 1-1 draw on home soil and Danny Ings in the famous triumph at Ewood Park helped restore the equilibrium. “I enjoyed winning because I’ve been here a long time and they’d gone on and on and on about how many years it was since we’d beaten them,” said Duff. “The two or three games before that must’ve been some sort of conspiracy too because I don’t know how we didn’t beat them. “Even I was hitting clearances off peoples’ knees and they were going in to the top corner. There’s obviously a lot of hype around it. Of manager Sean Dyche’s expected starting XI, Tendayi Darikwa, George Boyd, Andre Gray and Joey Barton are unfamiliar to the hostilities of the derby that has existed for 127 years. However, Duff is adamant that his team-mates will understand the importance and significance of the clash. “The players look forward to it as much as the supporters,” he said. “The players are fully aware of the importance of it. It’s important that we put in the performance and pick up the points. “The build up will be massive. Even if the players don’t know about it, once they walk out on to the pitch they’ll realise because of the noise. Duff added: “There’s local bragging rights at stake but you don’t get any extra points for beating them. We want to beat them the same as we want to beat everyone else.